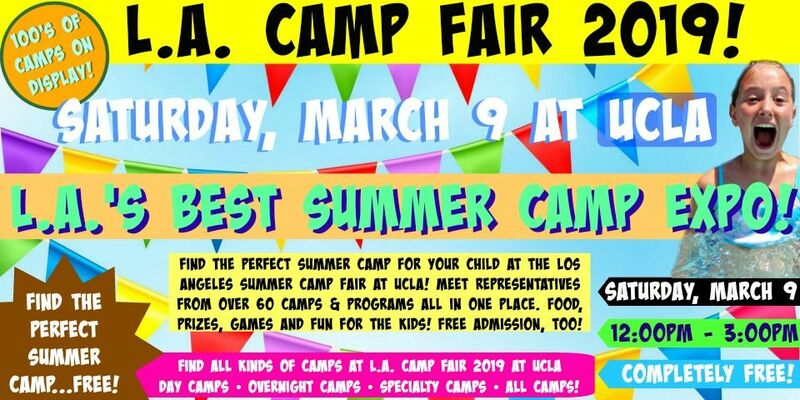 Find the Perfect Summer Camp for Your Child at L.A. Camp Fair 2019 Saturday, March 9 at UCLA! Admission is Absolutely FREE! THE CAMP FAIR AT UCLA IS TAKING PLACE SATURDAY MARCH 9 AT PAULEY PAVILION AT UCLA! Get your FREE TICKETS TODAY! 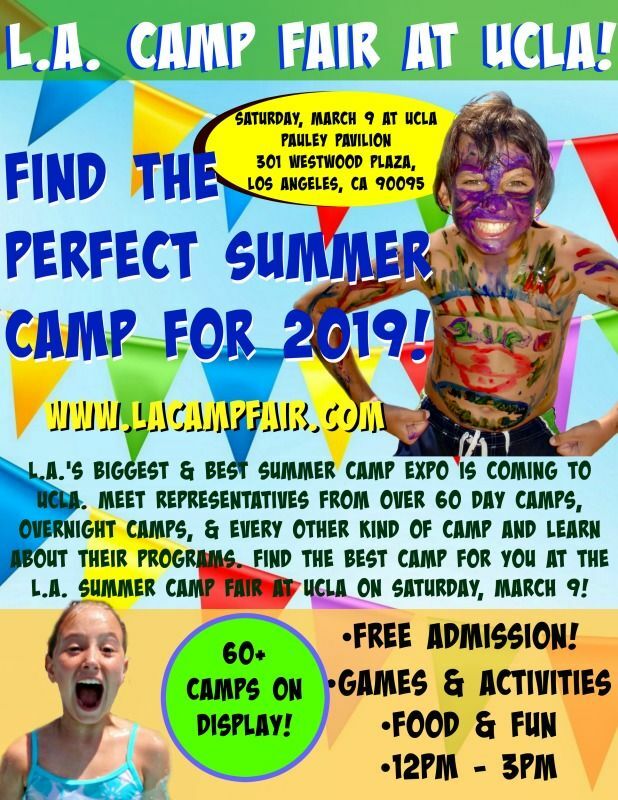 Make your plans to join us Saturday, March 9 from 12:00 to 3:00 PM for L.A. Camp Fair 2019 at Pauley Pavilion on the campus of UCLA. Over 50 summer camps and programs will be on display at the UCLA Los Angeles Summer Camp Fair. You will be able to go booth-to-booth meeting camp counselors, directors, and staff from over 100 participating camps and learn about their programs. There will also be games, prizes, raffles, and animals to play with for the kids, not to mention delicious food and an all-around good time. If you're looking for a safe and fun summer camp experience for your kids this summer, you won't want to miss this event. Print your own UCLA Camp Fair flyer to share with your friends, social network, child's school or anyone else you know who'd like to learn about the UCLA Camp Fair!!! Meet representatives from over 100 summer camps and learn about their programs. 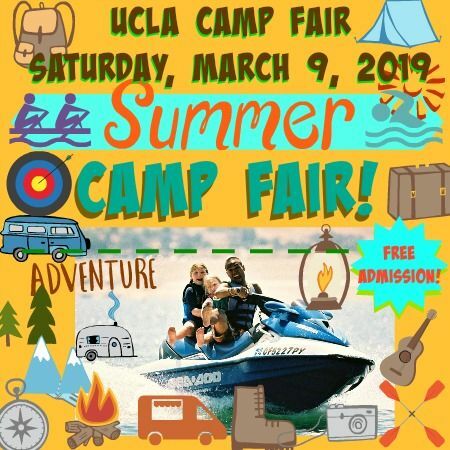 Find the best camp for your child at L.A. Camp Fair 2019 at UCLA on Saturday, March 9. It's FREE! • Parking: Park in Parking Lot 7 at UCLA for as little at $3 for one hour, or there is also free parking for 2 hours at the Broxton Public Parking Lot in Westwood Village (approximate 15 walk to Pauley Pavilion). One of the best things about attending a Camp Fair is you don't have to contact all the camps one-by-one for more information. All the camps are together in one place for your convenience instead. L.A. Camp Fair 2019 at UCLA is like a one-stop-shop for finding the best program for your child all in one place! When all is said and done, you can expect to see over 100 summer camps and programs at the 2019 UCLA L.A. Camp Fair event. And if you operate a summer camp and want to exhibit at L.A. Camp Fair 2019 at UCLA, please compete this registration form to reserve your booth. Space is limited and going fast! 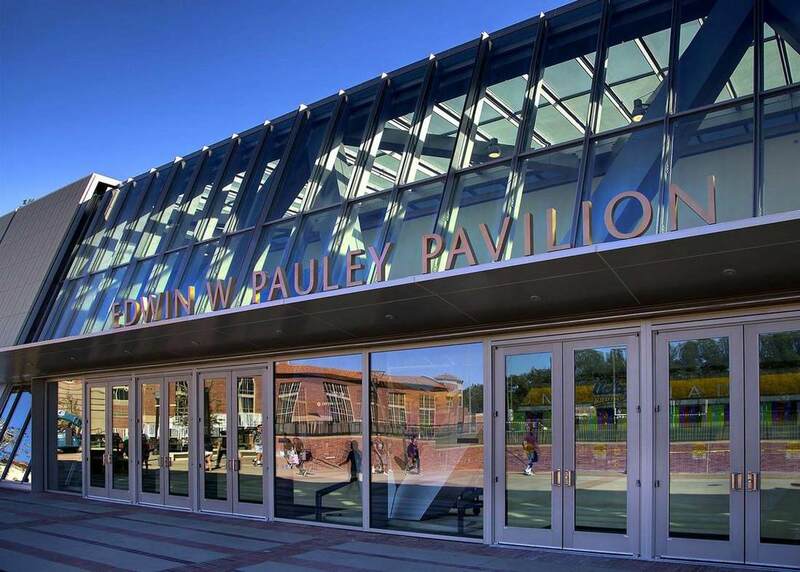 The UCLA Los Angeles Camp Fair will be held inside PAULEY PAVILION, right on the campus of UCLA. Enter Pauley Pavilion's main entrance and that's where the Camp Fair will be... you can't miss it!! You don't have to pay a dime to attend L.A. Camp Fair 2019 at UCLA. You visit with all these great camps, meet their staffs, learn all about their programs and enjoy the UCLA Camp Fair absolutely free. However, if previous Camp Fairs are any indication, the upcoming March 9 UCLA Camp Fair is going to be huge which means you'll need free tickets to get in. It's important you download your free tickets ahead of time because space is limited and we want to make sure we have room for you. Get your free tickets today!